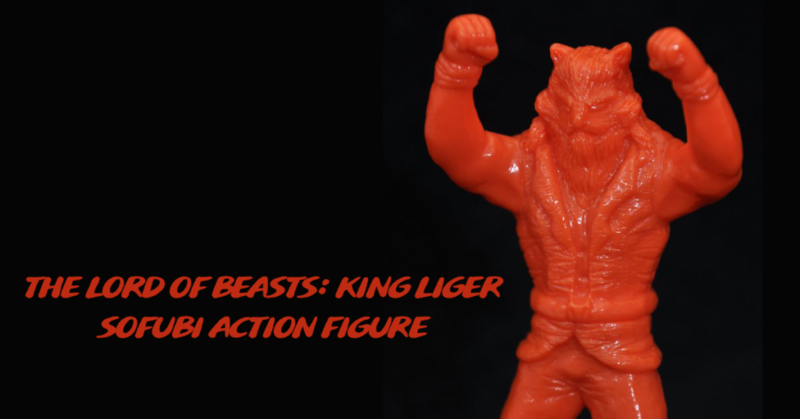 The Lord of Beasts: King Liger Sofubi Action Figure! Looking through my masses of emails before I head out to Prague for a weekend of beer & poker, I stumble upon an email from Mr Geoff Maxfield that I had previously overlooked. Following a successful Kickstarter in the year of 2016, Geoff has now released his first sofubi figure in association with Lulubell Toys. Meet the Lord of Beasts: King Liger! This 5.5inch Japanese sofubi figure is limited to only 15 pieces and is priced at $30 (£23). King Liger has one point of articulation at the waist and is made in a deep orange colourway. Paying homage to classic Wrestling/Tokusatsu toys, Geoff has done a great job with this release. You can purchase King Liger HERE. King Liger is masked hero from the Western state of Gujarat, India. His title has been passed down for generations. This particular incarnation of him has decided that the world has become peaceful enough that he can turn his eyes to his other great passion, professional wrestling. This does not sit well with his elders and he is banished from his home (not without stealing the costume before leaving). Word of a new Professional wrestler sporting the mask of a Liger spreads quickly through the world and catches the attention of a villain by the name of Dr. Silverado and his band of mutant warriors, The Silver Freaks. Silverado believes that if he can control King Liger, he can rule the world. So a new battle begins for our fated hero under the guise of a wrestling tournament. Who will be the victor? You decide!